‘Twas a full, fun weekend in these parts! The usual Saturday gardening was on hold due to the ground being much too wet, but Matthew headed out anyway to pick up G after his overnight at Baba’s house. While there, Matthew picked the first asparagus of the season (if you don’t count the single spear from last week) and supervised the delivery of a dump truck full of compost (20 cubic yards). Gabriel was very excited about both the asparagus and the dump truck! 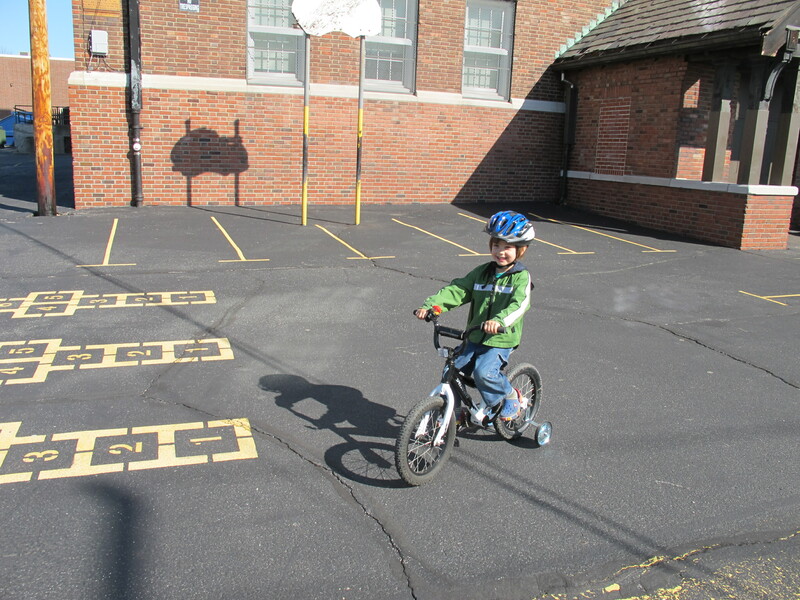 That afternoon, we headed to the local school playground with G’s new bike in tow. As you’ll see in the picture below, we went ahead and put on training wheels. Even with that addition, getting him to ride the darn thing turned into quite a saga (later post), so this was huge progress! 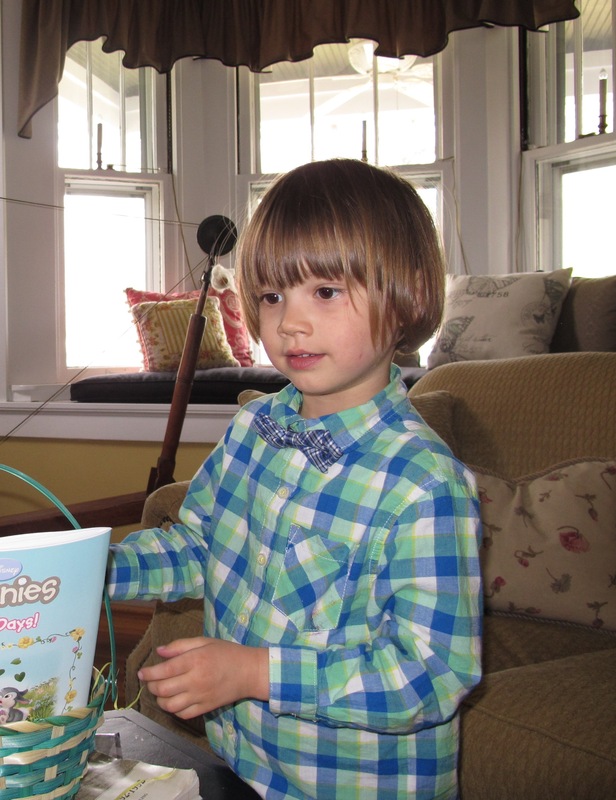 We kicked off Sunday with an indoor Easter egg hunt (Gabriel had been having “practice” Easter egg hunts for two weeks). Nothing fancy — just a few eggs with stickers, chocolate covered raisins, pistachios, and a few jelly beans. He picked out one jelly bean to eat before breakfast. After breakfast, we put on our Easter best, packed our bags with a change of clothes for garden work, and headed to church, then a very nice brunch (my FIL went all out!) . . .
. . . and egg hunt number two! This marked the first day ever (I think) that I have planned on Gabriel not napping. I’m not going to make a habit of it, as most days he could really use that extra bit of sleep, but it worked fine. Eggs were found, pictures were taken, and we were off to the garden! 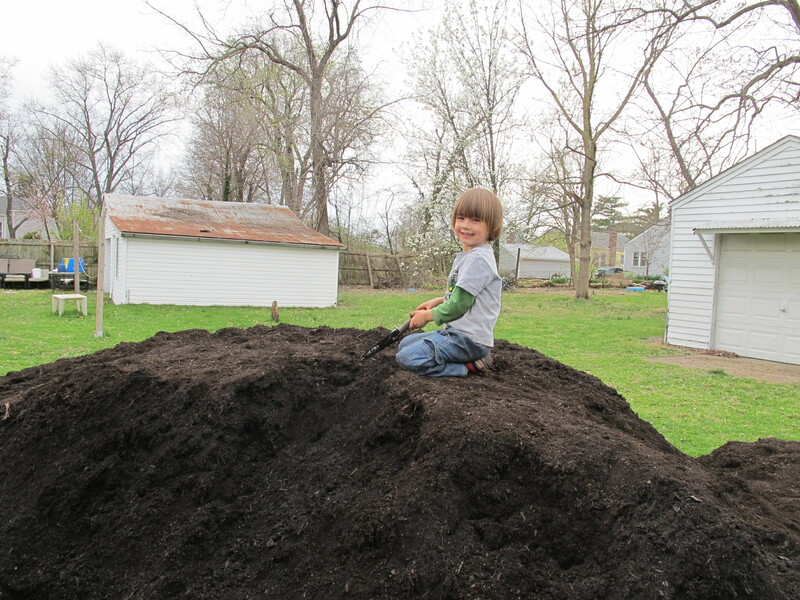 While we loaded and hauled 5-gallon buckets full of beautiful compost, Gabriel played king of the hill (and also “compost pile slide” and various other activities that would ensure he was thoroughly coated in the stuff). Unfortunately, it wasn’t warm enough to strip him and hose him off outside, so we settled for the bathtub at my MIL’s. The compost is still hot, so for now we’re just using it to line the paths in the garden (the dark rows in the above photo). Eventually we’ll add some to the beds. Matthew planted parsnip seeds and a few more potatoes. My MIL transplanted celeriac seedlings. I just pulled weeds and hauled compost. 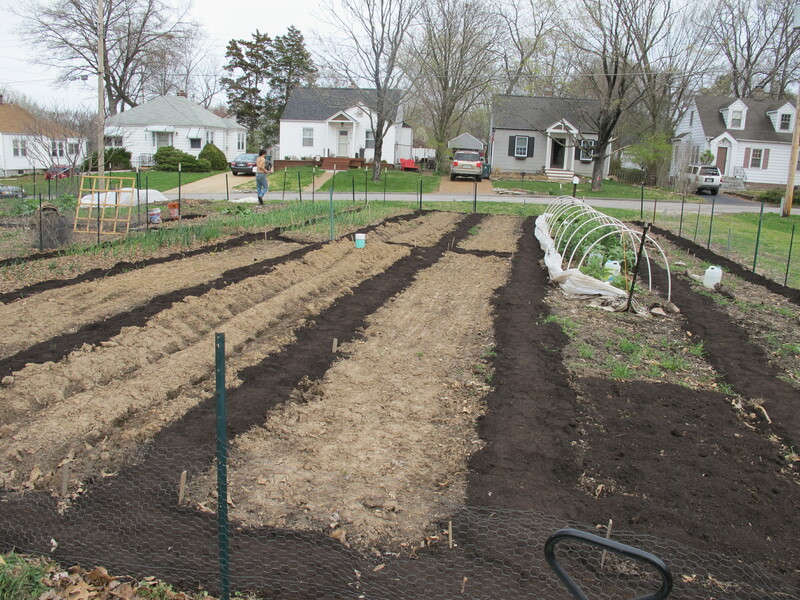 Despite the cool, wet weather, they’ve now finished almost all of the spring planting. The tired gardeners returned home to a simple dinner of black-eyed peas, rice, just-harvested Swiss chard, and sweet potatoes. It was just what I wanted after the rich brunch! 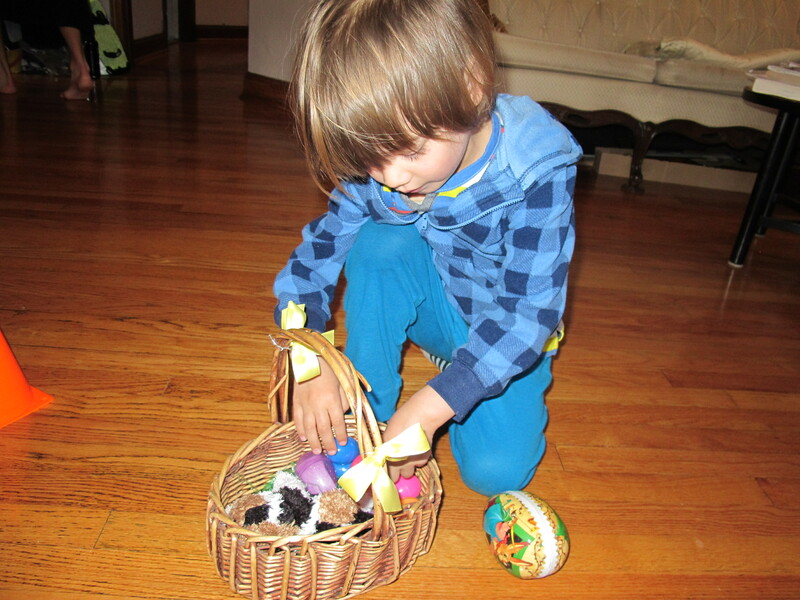 7 Responses to Bicycles, egg hunts, and garden time! Tracy, we got ours from Kirkwood Material. We’ll just be mixing it in directly with the soil that’s already in our garden, so I guess topsoil. “…the ground being much too wet… I’m sorta seething with jealousy. I’m already having to water my spinach plot just to keep it damp enough to have any hope of something actually sprouting. And a truckload of compost sounds like an amazing idea! I may have to break down and buy some this year rather than trying to just rely on the homemade stuff. Yeah, sounds like the Western states are really hurting. It’s easy to take the wet stuff for granted. Yes, we definitely don’t make enough compost to rely on that to enrich our soil (and even with a lot of compost, you’ll usually still need some additional soil amendments now and then, to balance things out). This is the product we got this year: http://www.hansenstree.com/products/organic-compost.php Some municipalities offer some kind of compost for free, though you usually have to pick it up (and the contents may be more questionable). Denver offers free mulch, but compost, well, you have to pay for that. Still, perhaps it would be worth it. One year I paid $40 for a truckload of horse manure. But apparently I got a tad bit over-enthusiastic and over-nitrogenized the soil leading to tomatoes that were all plant and no fruit. Do you guys actually test your soil to see how it’s doing in terms of nutrients? Yes, we do test, at least every other year. Your local extension service should have instructions, or maybe a larger nursery/garden center? You should get results and specific suggestions for amendments.